In a state such as California, a strict liability statute declares dog owners liable for damages when their dogs bite someone. 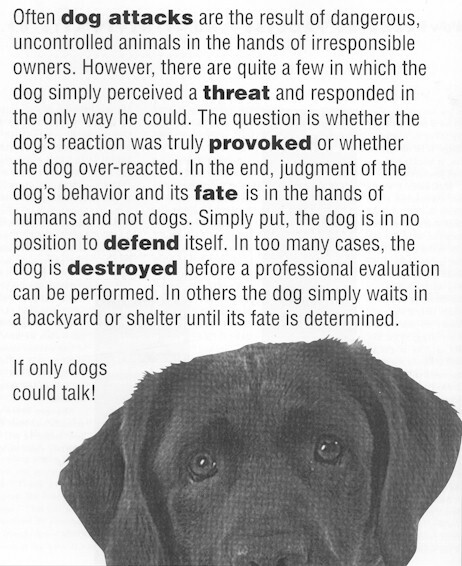 However, in a surprising number of cases, an in-depth investigation and use of an expert to speak for the dog can go a long way in convincing a jury that this was a good dog in a bad situation. This approach can be helpful in avoiding an excessive judgment and even removing punitive damages from the complaint. If Dutch, a five-year-old male, unneutered Staffordhire Bull Terrier, was able to testify at trial as to why he bit the nine-year-old boy who lived next door, he probably would have told us that he reacted to a sharp pain, the result of a dart being stuck into his hindquarters. Never mind the numerous times he had held still and tolerated being grabbed around the neck and held until his owners told the boy to stop. However, Dutch couldn't talk and as a result a wonderful family dog with no history of aggressive behavior whatsoever, was euthanized and his owners were sued for $350,000. On the surface, it was the kind of case that makes defense attorneys cringe. A Pit Bull and a young boy bitten in the face. The photos were quite disturbing and there would probably be permanent scarring. Only plastic surgery that could not be done until the boy was much older, would determine that. But a decision was made to take it all the way to trial if necessary. For some reason, both the carrier and their attorney felt that this case had merit and they were willing to invest the time and finances to find out the whole story. The plaintiff attorney, as often happens when this breed is involved was claiming that Pit Bulls were vicious and that the dog's owners were negligent in allowing him near the children. It didn't help matters much that the only photos the defendants had of Dutch showed a dog that looked as though he had worked out for 4-6 hours a day, every day, for his entire life. He had the physical presence that many people, who believe everything they read in the media, have come to know and fear. Also, there was the issue of the dart. It was found inches away from where the bite took place. The defense counsel believed that plaintiff stuck the dog with it but there were no witnesses. In order to sell what seemed like a plausible reason for attack to the jury, more evidence would be necessary. The defense decided to bring in an expert in canine behavior and aggression. Perhaps he would be able explain why this tragic event happened. The deposition testimony of plaintiff, plaintiff's parents, and the defendants told the basic story. The plaintiff, a nine-year-old neighbor and friend of the defendant's son, would come over to play every now and then. Each time, he had this habit of grabbing Dutch around the head and holding on. It was almost like getting the dog in a head lock. Dutch never growled or showed any signs of aggression when this would happen, he would only sit there with a solemn look on his face, waiting for someone to stop his discomfort. It seemed that plaintiff had two great Danes at home and was always comparing the size and strength of his dogs to Dutch. Each time he did it, someone in the house would ask him to stop. For some reason, he ignored them. On the day of the incident, both boys were in the back yard playing darts. The dart board hung from the roof of a patio facing the back yard. It had no walls around it so any darts that missed the target would sail out onto the grass. After throwing a round of darts, most of which ended up in the yard, plaintiff went to play with Dutch who was lying off to the right. His friend went to pick up the darts. Dutch's owners were nearby but not directly watching. One defendant was in the garage, about 15 feet away and the other in the house. All of a sudden everyone heard a bark and then a scream. They all came onto the scene within seconds and saw both Dutch and the boy on the floor facing each other. The boy was on his knees in a bowing position and Dutch had his paws out forward and his hindquarters in the air. A dart was lying a few inches from Dutch. There was blood on the ground and a piece of the boy's face was missing. The boy's mother was called immediately from across the street but she was so overcome with emotion that she asked the defendants, who she knew quite well, to take over and get her son to a hospital. Defendant found a small piece of flesh in the area where the attack took place and remembering a technique seen on television, placed it in a plastic baggie with a few ice cubes. Together, he and his wife took the injured boy to the emergency room. Review of the file left several important questions in the expert's mind. Firstly, was Dutch as good a dog as the defendants had claimed? In too many dog bite cases the owners do not tell the truth about their dogs prior behavior to their attorney or carrier because they are afraid of the consequences. Some simply refuse to accept responsibility and others are afraid their dogs will be taken away from them or in the worst scenario...put to sleep. This was definitely an area to be explored. If the dog's exemplary history was accepted on the owner's word alone and information to the contrary were to surface later, it would be devastating for the defense. Another point that interested the expert was the bark that everyone said they had heard just before the attack. Dogs vocalize in many different ways and the tone and quality of that bark might shed some light on what happened just prior to the bite. No matter how difficult this case seemed, there were several things that stood out in the expert's mind. First, the photos of the wound showed that there was only one bite. Although any bite is considered serious, from a canine behavior standpoint there are three criteria that indicate a serious bite; multiple bites, shaking of the victim, and difficulty in getting the dog to release. None of these applied. Dutch bit only once, there was not evidence of shaking which is part of a predatory sequence and he immediately let go quickly and on his own, without any outside interference. Considering the strength and agility of this breed, it was clear that it was not the dog's intention to do serious harm. In fact, wounds of this type are more commonly found in incidents where the dog is reacting out of fear or pain, lending support to the dart theory. Thirdly, the defendants, unlike so many in these types of cases, had been very responsible dog owners. Dutch was always licensed, his shots were up to date and his owner had invested a fair sum of money in professional training when he was younger. Also his veterinary records showed no record of aggression. This was notable, since many veterinarians put caution on the records of certain aggressive breeds like Pit Bulls, Chow Chows, Shar Peis and Rottweilers as a matter of course. Even the photos of Dutch provided a sense that Dutch was not what his muscular and powerful body declared him to be. The expression in his eyes, a vital clue to his temperament and aggressive potential showed a sweet and submissive dog with no trace of the viciousness the initial complaint had conveyed. The expert determined that it would be a good idea to interview the defendants and inspect the scene. This proved to be extremely valuable since a good deal of information was gained that did not come out in the defendants depositions. During the interview the expert asked pointed questions about Dutch's previous behavior and each time the defendants' answer was clearly consistent with their previous testimony. In order to impress a jury with Dutch's extraordinary record of good behavior, it was determined that a representative group of people including Dutch's trainer, groomer, and veterinarian as well as neighbors and friends be interviewed and asked to make a statement about their experiences with him. The references to his character given by everyone interviewed proved pivotal in communicating to the jury that Dutch was not a vicious Pit Bull. Instead he could be seen as a sweet and consistently even tempered dog who was loved by everyone who knew him. His trainer and groomer made especially positive remarks about his owners as well. One final question was asked of the defendants before the expert ended the interview. In effect, each was asked to bark like a dog, to try to make the sound of the bark that each heard just before the plaintiff was bitten. Everyone, looked at each other with disbelief but the expert would not relent. "Just do your best," he said. In order, each vocalized what they had heard and it was quickly obvious that the sound they were emitting was not a bark. The tone was high pitched and sharp. Most of them actually lifted their heads as they made the sound while their face coptorted as though they had just stepped on something sharp or banged their knee against a table leg. The bark they all remembered was really a yelp, the kind of sound a dog makes when a rocking chair rolls over its tailor you step on its paw. The sound a dog makes when subjected to a sharp pain. Each had described a bark because that was the only word that came to them. They simply were not sophisticated enough to classify it differently. As the defense attorney and the expert worked together putting the pieces of the puzzle in place, another piece of important information made itself known. Various records including those from school and a psychologist showed that physical abuse was not a stranger to the boy's life. His mother was battered by his father who was no longer living at home and evidence was presented that the boy's mother would punish him by grabbing his head in much the same way he had grabbed Dutch. This information suggested that the plaintiff's rough-housing with Dutch might have carried some hidden messages. Although the boy had healed quite well, gruesome photos of the boys wounds, immediately after the attack, were enlarged and placed on easels directly in front of the jury. Clearly designed to remind the jury of the severity of the attack, each juror would get an unsettling view of the boy's injuries each time they turned their attention to the attorneys standing at the podium. The defense attorney did a wonderful job of presenting a terrible situation in which her clients were not negligent while showing sincere compassion for the boy and the suffering he endured. The cross examination of him and his family was handled with great skill and sensitivity. Plaintiff counsel, on the other hand, seemed to have a different game plan. It seemed his intention was to make the dog look bad, make the dog owner look bad, and make the defense expert look bad. His closing argument focused on his client as an innocent boy who was mauled due to the harboring of a vicious dog by the defendants. To his credit, he did take some time to learn about canine aggression from his expert who did not testify at trial. However, his plan to turn Dutch into a vicious predator in the minds of the jurors did not work. Cross examination of the defense expert was especially detrimental to the plaintiff's case. Firstly, it succeeded, despite the attorney's attempts to do otherwise, in showing Dutch to be exactly what he was, a wonderful dog who had showed more restraint than many of us in the courtroom might have, given the number of times he had to endure the plaintiff's rough handling. Through testimony the jury was able to feel for Dutch and understand him. When they learned he had been put down because the owners thought it the right thing to do, more than a few tears could be seen on their faces. Although all the evidence about the dart and the yelp were presented again, the worst problem for the plaintiff was the attorney's assertion that the attack was an incident of predatory aggression. There are 32 types of canine aggression. They cover well known forms like territorial aggression and dominance aggression and go all the way through maternal aggression and predatory aggression. Each has its own definition and quality. Also, each has its own provocation or purpose. Obviously feeling confident that the expert would have to agree with him the plaintiff attorney started off the questioning by asking if dogs are descendants of wolves. The expert said that they were. The next question asked if dogs were then predators themselves. The expert did not agree. Surprised, the attorney asked why a dog if being a direct descendant of a predator is not a predator as well. The expert explained that a predator is an animal that hunts for and kills its food. The average domestic dog does eat out of a bag or a can as Dutch did. This is not the behavior of a predator. Dismayed, but not shaken, the attorney went on to claim that this attack was an example of predatory aggression, even though he did not have the expert's support on his last question. The expert again, did not agree. "Predatory aggression," he said, "always involves movement, a chase...the predator runs down his prey and attacks. Movement is included in the definition of this type of agression. In this case, Dutch and the plaintiff were right next to each other and no movement took place. Therefore, I do not agree that this was an example of predatory aggression." The expert then explained that based on the evidence, in his opinion, this attack was an example of pain induced aggression where a dog reacts to a sharp and sudden pain. He went on to say that this was the only type of canine aggression considered normal behavior in dogs. That is why when a dog tries to bite a veterinarian who has just stuck him with a needle, it is not put on the dog's chart. The expert went on to counter claims that Pit Bulls are inherently dangerous by giving a short history of the breed to the court. He made it clear that this was not a Pit Bull but a Staffordshire Bull Terrier. In many cases, the judge can be requested to ban the use of the term Pit Bull because it is not an accepted description and it is often used to inflame the jury. The breeds fame as a wonderful family dog renown for its affability with children was recounted, especially its reputation as aggressive with other dogs. It was made clear that the breed was bred to fight dogs not people. The defense had offered the policy limit of $100,000 early in the case but their offer was not accepted. At trial the plaintiff attorney asked the jury to award damages of nearly $340,000. Strict liability determined that the defendants were at fault because it was clear that their dog bit the plaintiff. Also the medical bills were high and there was a definite possibility of permanent scarring. The jury came back with a judgment for the plaintiff of nearly $103,000 which was well below their request. What was most surprising was that they awarded 15 percent comparative negligence to the plaintiff cutting the award by over $15,000 for a total of roughly $87,500. Interviews with the jurors afterwards confirmed that they believed that the plaintiff had stuck the dog with a dart even though there were no witnesses or observable marks of any kind. Clearly they saw through the labeling and false generalizations that were prominent all through the trial. To them Dutch was as much a victim as the plaintiff. There is an expression that says, every dog has its day. On this day, it proved true.